The stitch works great in straight lines. It’s excellent for seam embellishments in crazy quilting, and works really well as a smocking stitch. In the video, I’m working on even-weave linen, but the stitch can be worked on any fabric. It’s easiest to work in straight lines, but it also takes gentle curves well. When working on curve, it helps to think out the placement of the stitches, so that they end up even all the way around the curve. If you’re looking for other hand embroidery stitch instructions, feel free to check out my collection of embroidery stitch videos here on Needle ‘n Thread. thank u so so so much for doing this great work……. now i really dont have to go anywhere to learn different stitches… just need to come to ur page!!! hey. thank u so much . i am in f.a studying home economics. these videos are so much helpful for me to make different designs and patterns. thanks so much. i was worried on how i was to do my assignments, but now i don’t need to i’ll just come to your website. Thank you so much for making these video tutorials to share ..They are just wonderful. Hi, thobeka – thanks for your comment! I’m afraid I haven’t ready the series, but if it got you interested in embroidery, I think that’s great! With the ribbon in the herringbone stitch, lay the ribbon flat on your fabric and then work the herringbone stitch right over it, just outside the edges of the ribbon. The herringbone stitch will hold the ribbon onto the fabric that way. You could also work the herringbone stitch first and then push the ribbon in underneath it, but I think it’s easier to work the stitch over the ribbon. I have a Bunch of Books on embroidery – they’re all technique books. Do you mean how-to books, or do you mean story books? You can find my whole list of good reference and how-to books for embroidery here, at this link: https://www.needlenthread.com/books-links If you’re just getting into embroidery, you might want to get what’s called a “stitch dictionary,” so you can use it when you need help with a stitch. They have diagrams or step-by-step photos of how a stitch is made, and they come in really handy when you can’t get to the computer. I hope you have fun with your new hobby! Maybe you should embroidery a dragon, eh?! Thanks for telling me how to do that ‘ Ribbon in the Herringbone Stitch’. That’s really cool how you do that. I will look into getting a stitch dictionary.Embroidering a dragon would be lots of fun, thanks for the idea!Maybe I could add flames and things from the same series around the dragon with other stitches that I didn’t use in the dragon. Anyways, your videos are helping me a lot, thanks tons Mary! 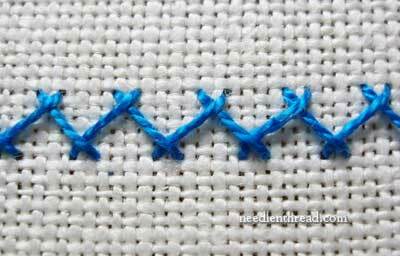 How about chain stitch? You could draw the flames, then fill them in, starting from the outside working in, tracing the line of the flame, using chain stitch in colors of red, orange, yellow, etc. Chain stitch works up pretty quickly and fills in nicely. Just work the lines close together, but not so close that they overlap. Mary I love you. No more words. This website is simply wonderful. I love embdroidery and I love you Ms.Corbet. Thank you so much for making these video tutorials to share with us. They are just wonderful and very detail. I love them. Thanks a lot. This is the best site I have found for learning embroidery stitches. 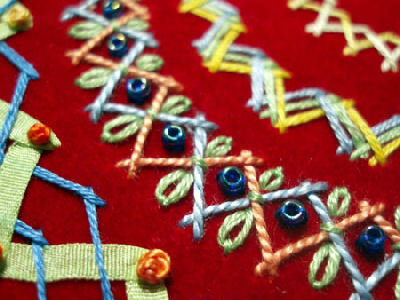 Want to learn more of simple hand embroidery. Please send me more ideas.